I mentioned a week or so ago that my UK publisher, Hodder and Stoughton, had decided to put out the ebook of Dead Men's Dust at the special low price of 99p (on Amazon.co.uk) and i thought great stuff. I should get a few extra readers from this. What I didn't expect was for the book to soar up the charts to the number 6 best seller position, and number 3 in the best selling thriller books, just behind stellar author Lee Child's latest Jack Reacher novel Never Go Back. Briefly it even knocked Gillian Flynn and Peter Robinson out of contention for the top spot, and nipped at the heels of JK Rowling. Was I stunned? You betcha! Now this isn't about the money. I won't see anything from any of those sales. 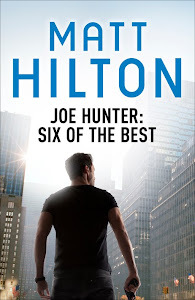 But what it means to me is the exposure that the best-selling chart position will bring, and surely this will mean that more and more people will become aware of the Joe Hunter books as a result. I'm over the moon. I'd love to see Hunter get more recognition, and hope this is just the little boost he needed. If you are a Joe Hunter reader/fan (and if not why would you be here?) please help him continue his onward march. If you know someone who hasn't tried a Hunter book yet, maybe they don't want to commit to a full priced book, then tell them this is a great opportunity while the price has been slashed. If every one told even one friend, then that's double the exposure. I thank you friends for the continued support. Without you, I wouldn't be in this happy position now. And neither would Joe Hunter. Great stuff. It's about time you and joe got a fraction of the recognition you both deserve. Awesome news Matt! Promotions like yours work wonders on Amazon, as I've been learning recently with my own ventures. I'd push your publisher to maintain one of your books permanently at that price for Kindle, and let the other books earn the revenue as awareness of your brand spreads.